In my prior post, I pointed out that She Who Must Be Obeyed wanted halibut and chicken wings for dinner. Here is how I did the Halibut. We were busy so I was looking for a quick cook. I mixed 5 ml (1 teaspoon) hoisin sauce and 5 ml (1 teaspoon) Miracle Whip and spread it all over the halibut fillet. Then I mixed 125 ml (1/2 cup) of dry bread crumbs and 7 ml (1 1/2 teaspoon) of Louisiana Grills Chicken Seasoning. You can use any seasoning blend you like. 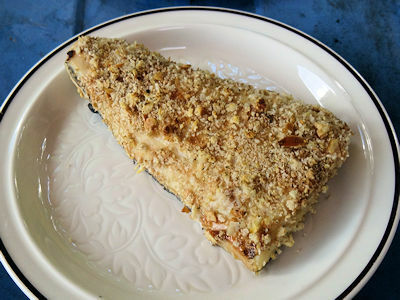 I pressed the bread crumbs onto the halibut fillet. 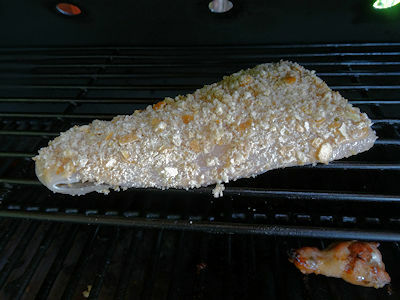 I put the halibut in my Louisiana Grills Pellet Smoker which was preheated to 350 F oven. You could also cook this in a 350 F oven. The length of time it takes to cook depends on the thickness of the filet. Mine cooked in 20 minutes. 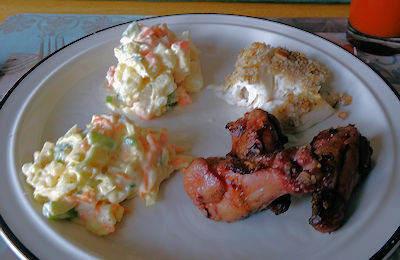 We served it with the chicken wings from the prior post, coleslaw and potato salad. This made a nice moist halibut filet that had a nice crispy coating and a nice touch of sweetness from the hoisin. This is a good recipe for a nice meal without a lot of work. Preheat smoker or oven to 350 F.
Mix Miracle Whip and hoisin together. Mix bread crumbs and seasoning mix together. Press bread crumbs on surface of halibut. Bake for about 20 minutes or until flaky. Thanks for the recipe I subscribe to your magazine.